I recall going to the Airport Drive-In at a time when (IIRC) Republic Airlines was flying jets into the adjoining Marquette County Airport and the soundtrack-drowning roar of the last flight of the day arriving during the movie. I used to catch movies at this drive-in back in the late 60s. After the screen was torn down, the projection house was used for office space by Simmons Airlines. I worked there until 1991 when I was transferred to Texas when AMR bought the airline. A recent site inspection reveals that the concession stil stands but appears to have been modified for other use. It is even uglier now than it was described to be originally The other remnants of the old place are the driveways, ramps, screen foundation and the couple of odd speaker poles lying around. I lived in the Marquette area from 1981 until 1990 and attended a few showings there. To be quite honest, I had been to better drive-ins. But my stepdaughter, who was only about six or seven at the time, had never been to a drive-in. I wasnt about to let here go through life without the experience since I knew drive-ins were becoming and endangered species everywhere else. 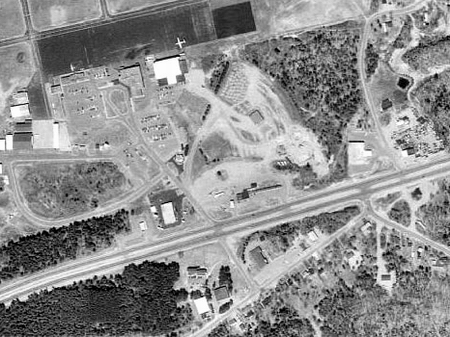 The Airport Drive-In, as its name implies, was located about a 1/4 mile or so from the runway at Marquette County Airport. It was located right behind the National Weather Service office and kitty corner to WLUC-TV. The screen was basically a glorified billboard painted white on one side, naturally, and the most unnatural shade of orange youll ever see. The projector and snack bar were located in a cinderblock bunker also painted orange. The speaker system, as I recall, worked reasonably well but it definitely paled when compared with theater sound systems. The last showing we ever attended was Top Gun, my stepdaughters favorite film, so that would have been around 1986 or so. What I remember most is that Airport always started off with some cartoons. These were a riot, not because they were funny, but because the years of constant use really stood out. Numerous splices, scratches, muddy sound tracks and torn sprocket holes were the norm. These were usually followed by the promotional reels for the snack bar. It started with 5 Minutes until showtime. Get your. (whatever treat) now. What was beautiful about all this is they show jumbo hotdogs, drinks, fries and popcorn that did not come close to matching the portions served by the snack bar. Also they advertised cigarettes, including pictures of brands that had not been made for over ten-years or more. Ahh, so much entertainment before the feature presentation. But it all came to an end about 1987 or so. The drive-in was located in an industrial park. With the advent of home video, the owners decided not to renew their lease on the property and Airport Drive-In flew off into history. The screen was torn down and sold for scrap within months after closure. Last time I drove by there, the projection and snack bar building was still standing. But Im not sure what its used for. In fact, the airport itself was closed and moved to the former Sawyer Air Force Base near Gwinn. Sorry to go on so long. But I wanted you to share some memories of one drive-in. (Terry Kovarik 6-20-02).